B2B Marketing Directions: Can Your Marketing Content Meet the Burden of Proof? The rules of B2B marketing are constantly changing. What worked yesterday won't necessarily work today. . .or tomorrow. This blog presents information, opinion, and speculation about where B2B marketing is headed. Can Your Marketing Content Meet the Burden of Proof? The CMO Council recently published a white paper - Better Lead Yield in the Content Marketing Field - that contains both good news and bad news for B2B content marketers. The white paper is based on a survey of more than 400 B2B content consumers conducted by the CMO Council's Content ROI Center and NetLine Corporation. Forty-one percent of the respondents were from companies with more than $100 million in revenues, and half held titles of director and above. First, the good news. Online content plays a big role in B2B purchase decisions. Eighty-seven percent of survey respondents said that online content had either a moderate or a major impact on vendor preference and selection. This finding demonstrates why good content has become essential to effective B2B marketing. Now for the not-so-good news. When survey participants were asked what types of content they most value and trust, vendor-created content came in last. 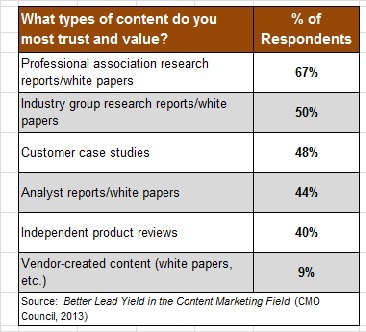 As the table below shows, B2B buyers value and trust professional association research reports and white papers, research reports and white papers created by industry groups, customer case studies, analyst reports and white papers, and independent product reviews more than vendor-created content. While these survey findings should concern B2B marketers, they are also understandable, at least to some extent. Business buyers have been conditioned to treat the information they receive from vendors with a healthy degree of skepticism. They recognize that vendors have an agenda, and they perceive that this agenda can cause most vendor-supplied information to be somewhat less than completely objective. The survey findings show that B2B buyers believe they will get more objective information from professional associations, industry groups, and independent analysts and product reviewers. In our criminal justice system, there is a presumption of innocence. An individual is presumed to be innocent until the state proves guilt beyond a reasonable doubt. In the B2B marketing world, most business buyers presume that vendor content is usually biased, probably not always accurate, and therefore not completely trustworthy. The burden of proof is on B2B marketers to develop content that can overcome this presumption. Meeting this burden of proof is particularly critical for content that is designed for early-stage buyers. That's because early-stage buyers will often form their first impression of your company based on your content. If you can establish credibility early, you'll take a big step forward with potential buyers. Many adjectives can be used to describe content that will build credibility with early-stage buyers, but I contend that two stand out in importance. First, credible content is authoritative. Marketing content doesn't need to read like an academic journal or a legal brief, but the main points you make should be supported by sound evidence, preferably from third-party sources. The second essential attribute of credible early-stage content is that it is non-promotional. For many early-stage buyers, even a hint of self-serving promotion will taint their view of the content. When I prepare a new early-stage content resource, I use a simple test to determine if it is sufficiently non-promotional. I ask myself this question: If I created a version of the resource without any obvious brand identifiers and gave that version to a reader, would the reader be able to determine who prepared the resource? If the answer to this question is "yes," the resource may be too promotional. I've been advising and supporting B2B companies for over twenty-five years. I work with clients to evaluate major strategic issues and initiatives, develop effective business and marketing strategies, and implement operational improvement programs. In the B2B marketing space, my primary focus areas are strategy development, content development, marketing process improvement, and marketing performance measurement.